Learn how to make Instant Strawberry Shrikhand Recipe | Strawberry Yogurt Dessert with a simple and easy video tutorial. 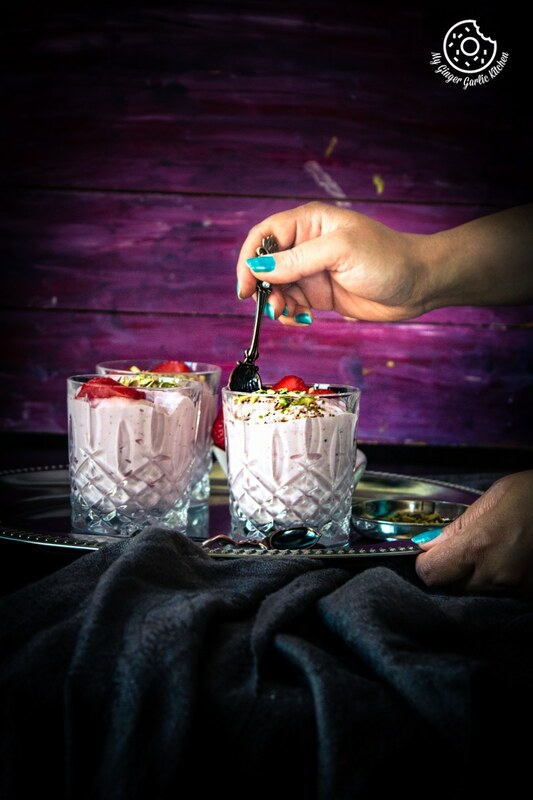 Strawberry Shrikhand is a sweet dish made with strained yogurt and pureed strawberries and has an amazing taste. 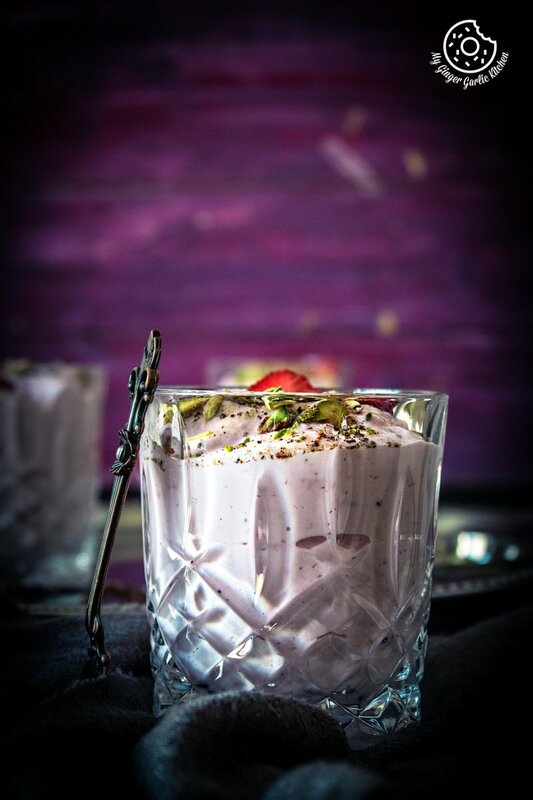 This sweetened strained yogurt or Strawberry Yogurt Dessert is one of the finest desserts of Maharashtrian and Gujarati cuisine. When autumn approaches, and you see grocery stores still selling some of the prettiest and luscious strawberries, that means the strawberry season is still on. And when you see those beauties, you can’t resist buying them. What better way to use them other than eating them non-stop or to have them in a dessert. Agreed? So, are you ready to sugar-coat your teeth with the luscious strawberries and thick yogurt cream? This is a vegetarian and gluten-free dessert. This chilled dessert is delectable, so very creamy, and loaded with amazing strawberry flavors. I am sure you would love this dessert because of pretty colors and major creaminess. The base of this dessert is made with thick strained Greek yogurt, strawberry puree, cardamom, and sugar. A touch of cardamom is a must for this shrikhand, but you can also add some vanilla for its characteristic taste. For the final touch before serving, you can also top it with sweetened strawberry puree or a simple strawberry jam/marmalade. This puree adds extra strawberry flavoring and surely makes it berrylicious. Also, it looks really pretty in terms of presentation. What is Shrikhand called in English? Shrikhand does not have an English translation yet, but to understand it better, you can see it as a sweetened strained and flavored yogurt cream. Shrikhand is a famous Indian sweet dish which is popular for its classic, creamy, thick texture, and delectable flavors. This sweet dish is prepared by using strained yogurt and usually flavored with cardamom, rose water and saffron. For making Shrikhand, yogurt is strained until it loses all its whey, then it is sweetened, flavored for perfection. And then chilled in the refrigerator. Shrikhand or Srikhand is best-served ice cold with a garnish of chopped nuts. Make shrikhand in advance and chill it for 30 minutes to 2 hours or overnight. When it’s time to serve, transfer it into individual serving bowls. 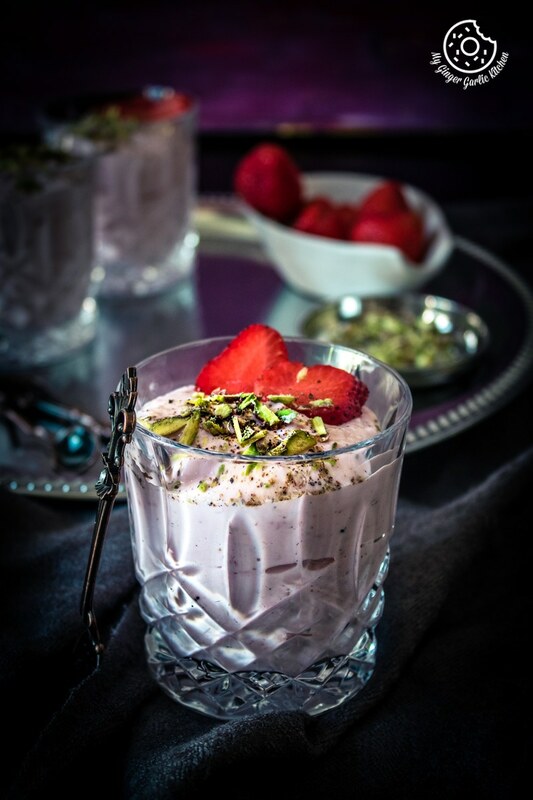 This tropical strawberry shrikhand is often served with poori or paratha. However, I like to serve it as an after meal dessert. Either way, it’s super delish. Making it is super easy too. If you love strawberries and any type of Shrikhand, you will instantly fall in love with this dreamy and creamy dessert. How to make Strawberry Shrikhand? 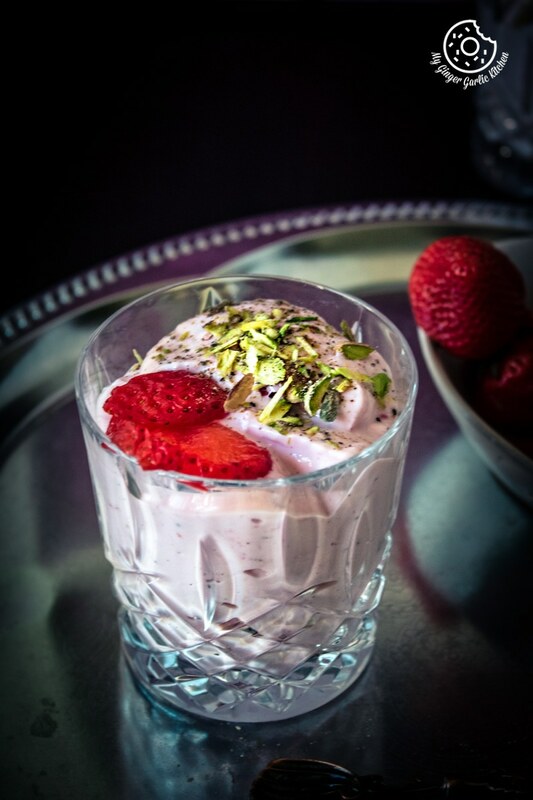 Here is my version of Strawberry Shrikhand /Srikhand. Yogurt/ curd is hung in a muslin cloth for around 8-10 hours. Once the liquid is drained out, the solid which remains in the cloth is known as chakka/hung curd. I used ripe and sweet strawberries for making the puree. Then I added “hung curd” which is strained yogurt. You can also use Greek Yoghurt if you want to cut straining time. Then I added powdered sugar, strawberry puree, hung curd and cardamom to a mixing bowl. After that, I whisked it well to combine until the sugar got dissolved and yogurt became smooth and creamy. Adding strawberry pulp to yogurt makes it fancier in the looks and also in the taste department. Finally, garnished with chopped nuts and sliced strawberries. What are some more flavours of shrikhand? What is the origin of Shrikhand? Shrikhand is extensively eaten in all parts of India. It is believed that the origin of Shrikhand is the Indian states of Maharashtra and Gujarat. Shrikhand is one of the foremost sweet delicacies in the Gujarati and Maharashtrian cuisines. Yes, Shrikhand is a probiotic. Shrikhand used yogurt as the main ingredient. And yogurt is one of the best sources of probiotics, which are friendly bacteria that can boost your health. 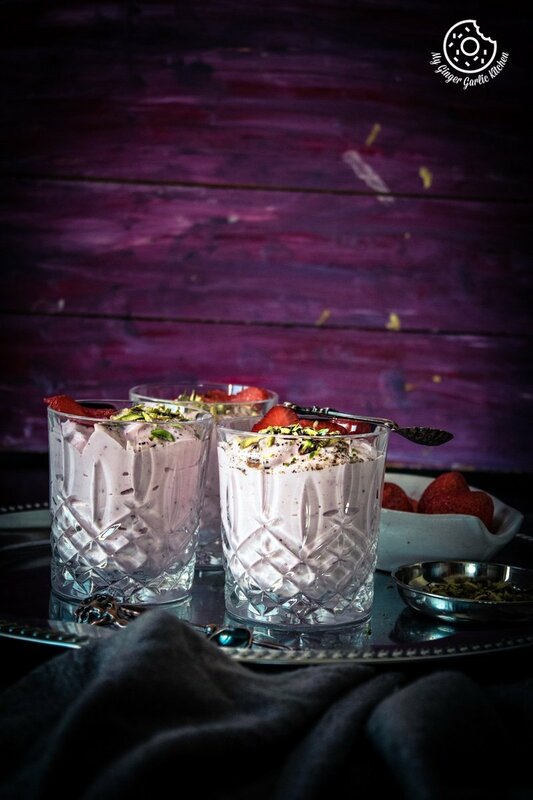 How do you make Greek yogurt Strawberry Shrikhand? For making Instant Strawberry Shrikhand Recipe | Strawberry Yogurt Dessert: First, you strain full cream Greek yogurt for 30 minutes. Transfer this thick and strained yogurt to a mixing bowl. Add powdered sugar, strawberry puree, some flavorings and whisk well until the sugar gets dissolved and combined well. Chill for at least 30 minutes. Serve. What are the ingredients used in making Shrikhand? Desired flavorings such as cardamom, saffron, and rose water. How to make Shrikhand thicker? Try to use full cream Turkish or Greek yogurt, if you want to make your Shrikhand thicker. Is shrikhand good for the stomach? Yes, shrikhand is good for your stomach and digestive system. Shrikhand is fully made with yogurt, and we all know that yogurt already has gut-friendly bacteria, that’s why it also helps in the times when you’re experiencing abdominal discomfort. It is a yogurt based dessert, thus it contains good amounts of calcium which improves bone health. It is also rich in Vitamin B.
Vitamin B is also known to aid digestion and also transforms food into energy. Moreover, this dessert ‘Shrikhand’ made with yogurt helps to keep you away from depression, so it keeps you happy and cheerful. This is also beneficial for people with high blood pressure if eaten in moderation. So while eating Shrikhand, you can experience that exotic taste, and enjoy the health benefits at the same time. 3. Refrigerate for overnight, this will remove excess whey. Strain only for 30 minutes, if you are using Greek yogurt. 4. Hung yogurt or chakka is ready. Whizz the strawberries in a food processor or using a hand blender, to make a smooth coulis. 6. Add strawberry puree, cardamom powder, sugar, and whisk well until sugar is dissolved and yogurt becomes creamy. Once chilled, simply pour it into a serving dish. 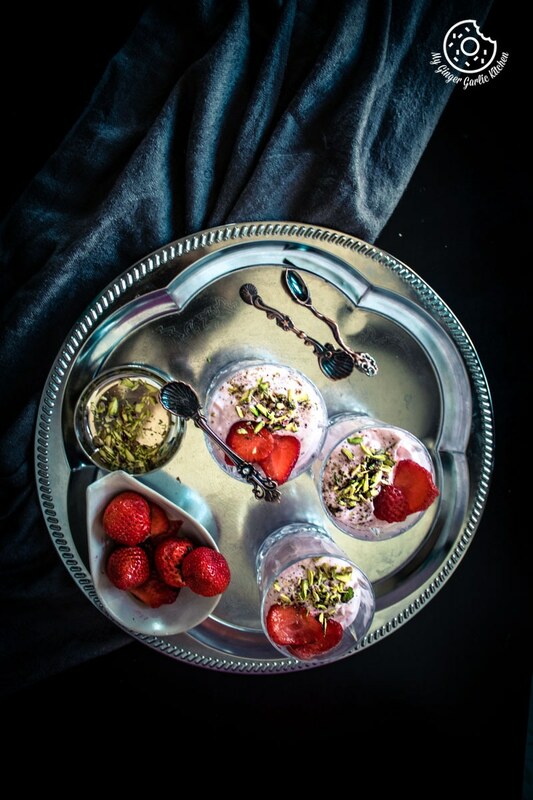 To serve, decorate shrikhand with sliced strawberries, sliced pistachios. And sprinkle with some cardamom powder. 1. I have used homemade strawberry puree using fresh Strawberries, but you can also use frozen Strawberries. If using frozen strawberries, simply thaw at room temperature for 30 minutes before making the puree. 2. 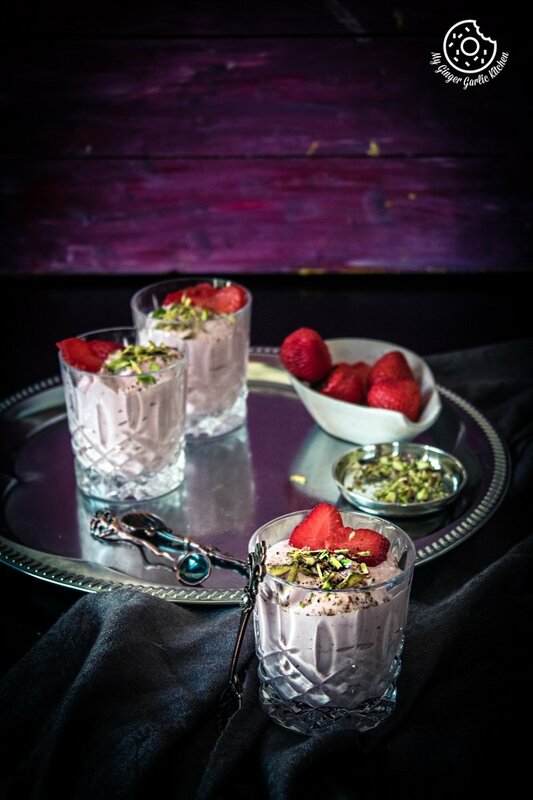 You can also add about 1 tsp of rose water to this strawberry shirkhand. 2. You can increase or reduce the amount of sugar according to your taste buds.